I believe in the democracy of storytelling...stories can cross all sorts of borders and boundaries...I don't know of a greater privilege than being allowed to tell a story, or to listen to a story. They're the only thing we have that can trump life itself. i just returned from a long weekend in metro dc - reflecting on my visit, i think the theme for the trip was stories. there was lots of visiting with friends and families - and when humans get together there are stories! for the last few years i've chosen oscar weekend to visit to my family of origin. my mom and i share a love of the movies - and we both enjoy watching films on the big screen, we will settle with dvds if we miss something at the local moviehouse. this year was a good year for both of us - i ended up catching 7 of the 9 films nominated for best picture and my mom also saw 7 - however, her seven weren't the same as mine (the two i missed were war horse and tree of life; ma's were hugo and extremely loud and incredibly close). my daughter em flew to dc with me which was great, em wasn't able to stay as long as i and she left sunday afternoon before the movie madness began. although emma shares the family passion for stories and films, most of em's movie viewing happens once movies come available through dvds and streaming, and the oscars were of little interest given that she may have only seen a couple of the films nominated (in all categories). we spent thursday museum hopping - in the morning we went to the phillips collection in order to view the exhibit snapshot: painters and photography, bonnard to vuillard it was grand. both bonnard and vuillard are among my favorite painters and i never before realized the role photography played in their lives and art. after the show we met up with friend and fellow blogger reya. this trip to metro dc, reya met not only my daughter but also my brother - on the way to meet reya, who should em and i run into sauntering down seventh street but my brother! coincidentally, paul took the day off so he could do a bit of museum hopping on his own - he was heading to the newseum! after swapping a few stories, paul went his way and em, reya and i went ours. we spent the rest of the day together - after a lovely, leisurely lunch we checked out the annie leibovitz: pilgrimage exhibit. this exhibition of annie's work is unlike most others of her photographs as there are no portraits - instead, the show celebrates places, and the objects of people which are sacred to leibowitz. powerful. another theme for the trip was definitely sisterhood - found and familial. in addition to reya, a found sister, in town from washington state was alice, my best friend of thirty-nine years. alice had work in dc till thursday, when her work ended, she met up with us. reya took us to her favorite watering hole - the matchbox - which was wicked fun! not only did the found sisters hit the matchbox, but my brother paul wandered over to have a drink with us before heading back to his house in maryland! after fun at the matchbox, em, al, and i headed to virginia - picking us up at the metro station were two more found sisters - donita and her daughter zoe. donita is another close friend - donita was alice's first college roommate and who weirdly now lives just a couple miles away from my ma! the three of us have remained close despite three decades of never living near each other. well enough rambling about my recent ramble- this is tuesday after all and the point of tuesday on the mouse is to celebrate tattoos! lucky for you and lucky for me i just happened to encounter a fellow with some incredibly interesting body art - and each tat is a story in itself. 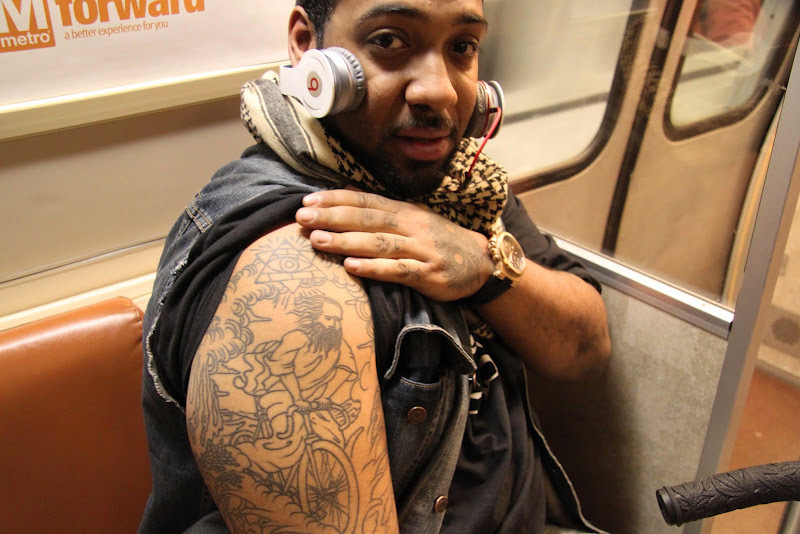 today's tattoos are adorning the arms and hands of benjamin who i met on the washington metro yesterday. when benjamin entered the car i was immediately taken by his body art - bold mouse that i am went over to him whereby i introduced myself and asked if he would be let me take photos of his tattoos. he most graciously said yes - since we were on the metro there wasn't much time to hear the stories of behind each tattoo - so you will have to use your imagination! however, i will tell you that benjamin is a bike messenger - clearly the inspiration behind the wonderful tat of moses riding a bike that can be seen in the top snap. speaking of bikes, the opening quote is from colum mccann - a young writer who when faced with a serious case of writer's block found inspiration and his voice by hopping on a bicycle where by he proceeded to pedal across the country for a year and a half, covering 12,000 miles and winding through 40 states (source) . i have yet to read anything by mccann but after learning that he won the national book award for let the great world spin, and reading these reviews, the book is now at the top of my must read list! I like that he's left a lot of blank space in the work, so you can really appreciate the design. 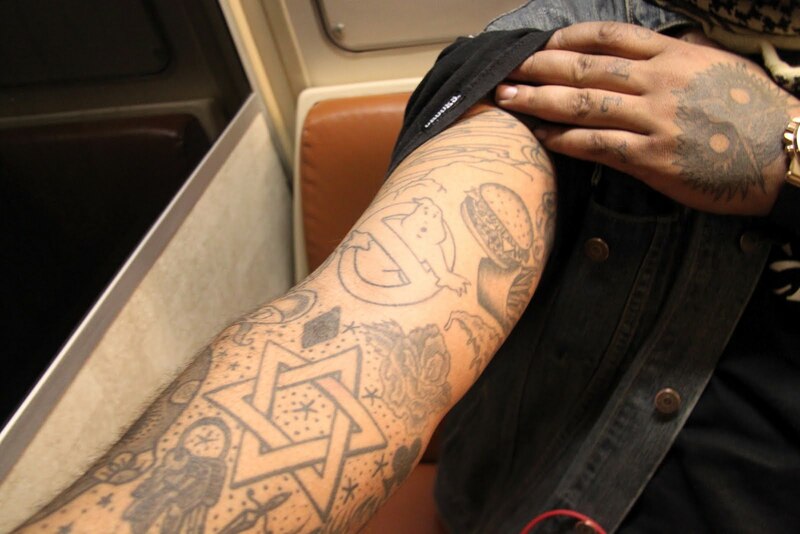 Tattoos are often so dense it's hard to know what you're looking at. I love that you are a bold mouse! That sounds like such a great encounter and I am sure he really loved sharing the story about his ink with you! Cool! Wow I love these tat posts! Sounds (reads) like such a fun day kimy! 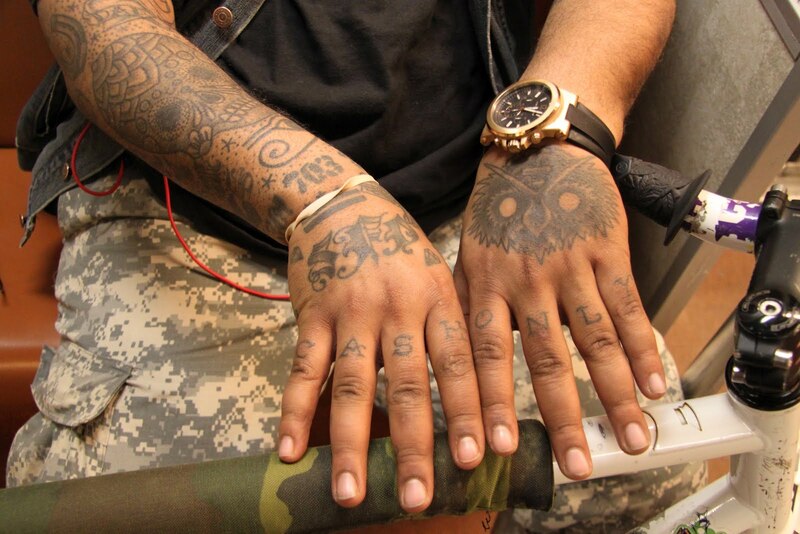 And Benjamin's tats are awesome! I love the way people share with you. Sounds like a ton of fun in DC, that most beautiful of all cities...well, one of them anyway. When I see extensive tats on people, I remember "The Illustrated Man" by Ray Bradbury and wonder if these younger folk have read it or would like it? I think so. That IS some incredible body art. I love the burger and fries, LOL! I'm glad he was so amenable to being photographed -- bike messengers can sometimes be pretty gruff characters, in my experience.